The origins of the Archer date back to 2458 when Earthwerks Incorporated debuted a prototype known as the ARC-1A Archer. 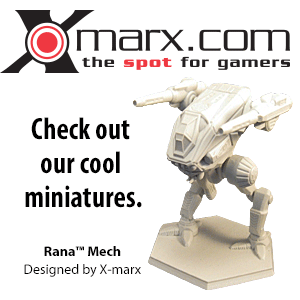 The design was created at the request of Terran Hegemony's HAF for a new "heavy fire support BattleMech" and took nearly 9 years to finalize. This was in part due to the design team; a combination of former HAF MechWarriors, field technicians, and general officer consultants and the company's engineer team led by Supervising Engineer Linn Tommi squabbling over theoretical and practical issues. The complex engineering proposal brought before the HAF included complicated, hard-to-repair stabilization equipment and advanced, computer-slaved sensors, meant to make the Archer the most accurate BattleMech in existence. However, the final prototype abandoned these requirements in favor of a more sturdy, blocky, and heavily armored frame still familiar today. It was so successful that it remained the Hegemony standard for more than a decade and a half until advances in technology allowed Earthwerks to produce a more efficient model. Introduced in 2474, the ARC-2R Archer became one of the best-known and most widely-used BattleMechs available. 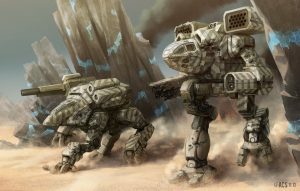 A contemporary of 'Mechs such as the Thunderbolt and the Banshee, the Archer's primary role was fire support, though early in its combat career it was considered an assault 'Mech capable of long-range brawling, and it was used in a variety of other roles. More than 100,000 Archers were produced between its introduction and the start of the First Succession War, with tens of thousands of its variant models produced over the centuries. Though many were destroyed or dismantled for spare parts, they remained a common sight in the Great House armies, with six different factories producing new Archers throughout the Succession Wars. The recovery of the Helm Memory Core had a profound effect on the development of the Archer. New variants were produced which utilized rediscovered lostech, giving the venerable 'Mech a few new tricks to surprise its opponents. By the time of the Clan Invasion, most of the major manufacturers had switched over to building these new variants for the Free Worlds League, Federated Commonwealth, Free Rasalhague Republic, and Wolf's Dragoons; only Vandenberg Mechanized Industries continued to build original ARC-2R Archers for the Taurian Concordat. Newer, more advanced variants of the Archer continued to be developed as technology progressed in the years since. The Archer's primary weapons were a pair of Doombud LRM-20 missile launchers with four tons of ammunition, enough for two minutes of continuous fire. The ammo was split between the side torsos. When the design was still relatively unknown, some Archer drivers were known to keep their missile bay doors closed in order to fool the enemy, but this trick has since lost its effect. For close combat situations, the Archer carries four Diverse Optics Type 18 Medium Lasers. Each arm is equipped with a laser, with the other two mounted on a centrally-located turret above the cockpit, giving them a clear field of fire to attack targets behind the 'Mech. Though not a particularly adept hand-to-hand combatant, the Archer's oversized battle fists serve it well in close combat and allow it to easily pilfer supplies when taking part in a raid. The Archer was well protected by thirteen tons of armor and had a cruising speed of 44.1 km/h. However, it suffered from a poor heat management system, with just ten heat sinks to remove waste heat; an Archer firing both LRM launchers and its lasers would quickly start to overheat. The Archer also suffered in part for being for being so common; most enemy pilots were very familiar with the design's capabilities, and how to exploit that to their advantage. The most unique feature of the Archer compared to other humanoid 'Mechs was its cockpit placement, located beneath the central torso. Although giving the MechWarrior a unique battlefield perspective, this placement didn't provide any additional protection as it sat below the torso armor belt, which shielded the Gyro and engine from enemy fire. Personal 'Mech of Lieutenant James Ismail of the Lexington Combat Group's 180th Dragoon Combat Group has been refit for close combat. This is achieved by dropping both the Artemis-enhanced LRM-20s for eight SRM-4 launchers, four per torso, while the two rear facing medium lasers are also removed for two forward facing Medium Pulse Lasers. Named for Morgan Kell's pirate lover, MechWarrior Online's Archer Hero 'Mech plays to the fan rumors that Kell's Phantom Mech ability was actually just LosTech he recovered from the Periphery before his return in 3006. Identical to the standard ARC-2R in most respects, the addition on an Endo Steel frame frees up the weight for a Guardian ECM suite and two extra heat sinks, all of which are upgraded to double heat sinks boosting the Tempest's endurance. Jaime Wolf: It is implied from conjecture that he initially piloted his unit's trademark 2W variant. He lost one such vehicle on Barlow's End in 3026 but continued to pilot Archers (presumably advanced technology versions). He was found dead in his Archer near the end of the Battle of Harlech City on October 18, 3067. Morgan Kell: The commander of the Kell Hounds became famous in the legendary Phantom 'Mech incident. Alexander Carlyle, son of Grayson Carlyle of the Gray Death Legion, piloted an Archer during the Skye Rebellion of 3056. Cranston Snord was known to pilot an Archer before swapping to a Bombardier following the Fourth Succession War. The introduction date for the ARC-2R Archer is listed as 2474 in a couple early sources such as TRO:3025 (Original) and TRO:3039 where-as XTRO:Primitives V lists the production date as 2475. ↑ 8.0 8.1 8.2 Experimental Technical Readout: Primitives, Volume 5, p. 6 "ARC-1A Archer 'Mech Profile"
↑ MUL Profile for ARC-1A includes BV2. ↑ Combat Manual: Mercenaries, p. 53 "Lexington Combat Group - Lieutenant James Ismail"
↑ BattleMech Manual, p. 90 Battlemech Quirk Table - Archer Entry. This page was last edited on 7 April 2019, at 14:54.